Our 3 year old is and always has been a HUGE Thomas fan. We spent his first birthday at Thomas land (which is part of Drayton Manor) and created such wonderful memories for our family. We returned last Christmas and again had such a fantastic time. Magical Christmas at Thomas Land is just that - magical (Read about our Christmas trip here). If you visit Santa at Drayton Manor over Christmas he gives every child a magical pass which enables them to return to Drayton Manor at anytime throughout the main season in the following year for free (children must be accompanied by paying adults). We took advantage of this deal and returned to Drayton Manor this summer using our golden tickets. We arrived just after opening on a beautiful sunny day at the beginning of the Summer holidays. We paid our entrance fee and had no problem using our golden tickets to allow our children free entry. Car parking is charged at £3. When you enter Drayton Manor, Thomas land is pretty much the first thing you will spot. We are huge Diesel fans and hopped straight onto the Diesel Locomotion Mayhem. The boys were in one train and the girls in another. It feels as if you are going to crash into each other at some points so this ride is lots of fun. Next we were eager to join the queue for Winston's Whistle stop tour. This takes you all around Thomas Land on a monorail. We have never had the chance to ride before as this ride closes in bad weather. No excuses today though! The queue for this ride was the longest we encountered all day (it was still only 20 minutes or so). I am pleased to say the queuing was worth it and we loved the views around Thomas Land. There are a few small rides within Thomas Land that had no queues at all when we were there - Lady's carousel and Bertie the bus. Our children were tall enough (over 0.9 metres) to ride these ride's unaccompanied and enjoyed them several times throughout the day. We paused the listen to the Fat Controller sing a few songs and then hopped on board Percy at Knapford station to take us to the opposite end of the park. The train rides around the park are fantastic - there are usually 2-3 different trains running at once. We ended up catching the train four times in total! All of your favourite Thomas songs are played as you are waiting at the station and there is always lots of anticipation as you wait for your train to arrive and try and guess who it will be. Another attraction we have never had the chance to visit in previous visit's (as it has been too cold) is Spencer's adventure play area. This is a huge outdoor play zone based on Spencer the train. There was lots for young and old children to do and we absolutely loved it. I think we spent 45 minutes here in total. Drayton Manor is home to a good sized zoo with over 100 species to discover. We walked back to the main part of the park through the zoo. I loved the monkeys, big cats, owls and meerkats. All of the enclosures were well presented and we were lucky to see some of the big cats being fed. Back in the main park, we decided to ride the cable carts. The view of the whole park was stunning and I would certainly recommend doing this. There are only 4 people allowed per cart so it was just me and Jack in ours - he sang me a little song throughout our journey which was very, very sweet. Our thirst for heights continued and next it was time to ride the big wheel. I was pleased we could all ride this attraction together in one pod. It was time for lunch so we decided to take the Thomas train to the station cafe. I was really impressed with the prices here - £3.95 for a kids picnic pack and £3.95 for a toasted panini. This is cheaper than some local soft play centres! I also spotted some fab family deals around the park such as 4 pizzas, sides and drinks for £20. At these prices I do not think it is worth bringing a picnic with you. After lunch we caught the train again back to Thomas Land (can you see a theme here) and tried some of the other Thomas rides. Our eldest two loved Cranky the Crane (check out Heidi's face). Jack was a little apprehensive and opted for a photograph with Toby instead. We spent the rest of the day at Thomas Land trying out the other rides. Although there was a lot more of the main park we could have explored and enjoyed as our whole family is Thomas-mad we just didn't want to leave this part! I think we will return when the children are teenagers as there certainly were a lot of teens enjoying white knuckle rides that looked fun. 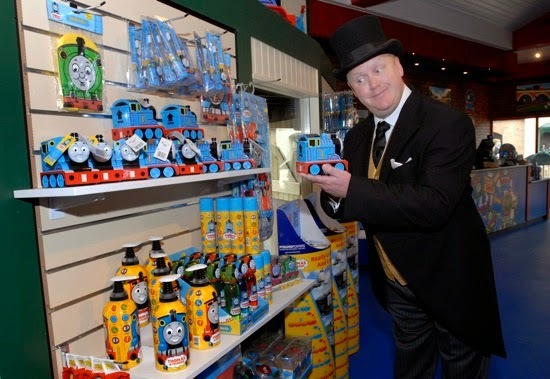 You cannot visit Thomas Land without a trip to the gift shop. The Thomas gift shop is HUGE! Our three chose a train each to add to our ever-growing collection. Take and Play trains were about £7 each which isn't too bad. We had such an amazing day at Drayton Manor. I always say it will be a few years before we return but I just know we will be back next year! This photograph sums up how happy our children were. Half way through the holidays!